Home Latest News & Updates at Leisure Lakes Bikes Electric Bikes -Bosch vs Yamaha vs Shimano -What’s The Difference? 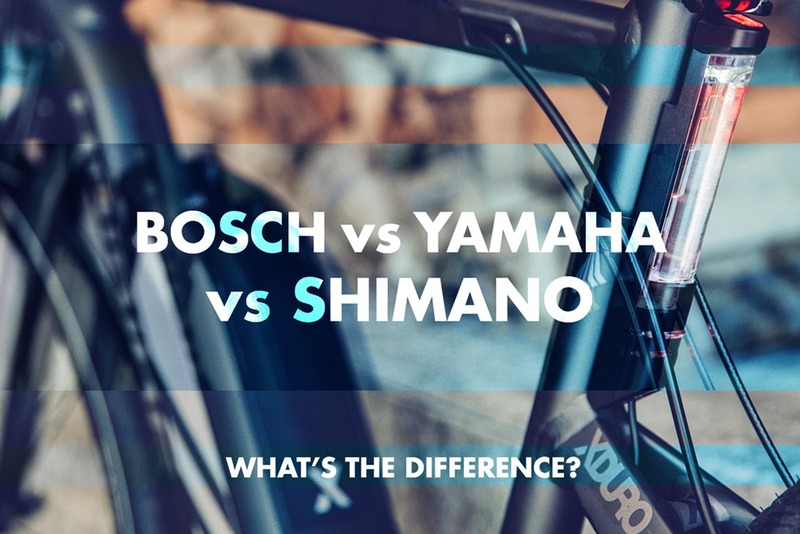 Electric Bikes -Bosch vs Yamaha vs Shimano -What’s The Difference? With electric bikes really starting to take the market by storm, it’s fairly new territory for everyone, and even though you may recognise the names behind the electric technology, do you know the differences in the motor brands and which one to go for? If not then you’ve come to the right place! We’ve got a full run down of the differences between Bosch, Yamaha and the brand new Shimano STePS systems to get you e-clued up before buying your first (or next!) electric bike. If you want to know more detail about each brand of eBike systems then check out our buyers guides for Bosch eBike Systems, Yamaha eBike Systems and Shimano eBike Systems. Off: Completely off, no digital display. Off: No support; all on-board computer functions accessible OFF: Allows you to ride without power assist while switch functions remain enabled. Eco: 150 km - Support ratio 70% of your pedalling power Eco: Effective, optimally efficient support for maximum range (% of input dependant on Bosch eBike system) +ECO: Range of +Eco mode will be approximately 30% longer than Eco mode. Normal: 100 km - Support ratio 150% of your pedalling power Sport: Immediate, powerful support for sporty riding, for both mountain biking and road riding (% of input dependant on Bosch eBike system) ECO: Saves energy for an extended cruising range. Best used when cruising on a flat road. High: 70 km - Support ratio 230% of your pedalling power Turbo: Direct, maximum support to the highest cadences for ambitious, athletic riding (% of input dependant on Bosch eBike system) STD: Satisfies both power and cruising range. Recommended for daily use. Is there an advantage to having more riding modes? This is a hard one to answer, simply because it depends on the type of riding you do... Let’s say you wanted to head out onto the mountain for the first time (or the first time in a long time), or you wanted to start riding to work to build your fitness across longer distances, then the Yamaha motor with more modes would be appealing. Simply because you can preserve your battery life by lowering the assistance mode, so you can ride further and also build up your fitness to a higher level at the same time. This isn’t to say fewer modes are a bad thing either! Shimano STePS and Bosch systems both feature 3 modes so you could still do exactly what’s stated above but you don’t have that extra ECO+ mode, which you may feel you would never want to use. A great feature of the Shimano STePS system is that it will automatically shift down to a lower gear as you stop and give you that extra surge when you set off again for an easy start; this happens without it being classed as an extra mode. All the electric bike systems from Shimano, Bosch and Yamaha are pretty much on par with each other when it comes down to the battery voltage, run time and chargers/charge time. The only slight difference between the three is the size/weight with Bosch coming in at the lightest of the three, then Shimano and not too far behind is Yamaha. Again these can all vary depending on the type of bike you buy and the eBike system that it comes with, so make sure you check the specification of each electric bike to see a side by side comparison for each model. Bosch have the most extensive range of eBike system displays and although different bikes will come with a different display (depending on the bike and specification the brand has chosen for that bike model) you can purchase their display units separately to upgrade or change your current set up. Bosch Purion – this is the latest display unit available and fits neatly next to your grip meaning less clutter on your bars and easy switching between modes. Bosch Nyon – The most advanced display unit featuring GPS, current speed, cadence and loads more features that are all linked to your smartphone app. Bosch Intuvia – A two-piece unit display with mode changing control that sits by your grip, and the main display in the centre of the bars giving you a great view of all the information in a bigger screen. The two Yamaha eBike systems that are available come with their own display unit, but just like Bosch, you can swap this display to any of the other display units they offer. Yamaha PW-X: Simple, tough and located neatly on the bars featuring a new, ergonomic switch that maintains high operability during any type of riding. Yamaha PW LCD: Designed for all forms of riding including the newly adopted vertical display that makes information easily visible. The switch sits by your grips making it easy to change modes as you ride. Yamaha PW LED: This is a simple and easy to use unit to change modes with only the basic displays for those who like the simple life. Shimano have just the one display unit for each of their STePS eBike systems depending on the model of bike; City or MTB. Both feature a handy switch that sits close to your grips so you can change through the ride modes and see everything you need to know on the sleek, bar-mounted cycle computer. What’s different about this system? You can link up to your smart phone via Bluetooth using the E-Tube software platform which allows you to change settings and customize the set-up via computer, tablet or smartphone. Shimano STePS City: Simple and easy shifting with a bar-mounted cycle computer so you can keep track as you ride. Shimano STePS MTB: Slimmed down for no-fuss riding with di2 gear shifting and riding mode changing done all in one place with a simple display that sits parallel to your stem. Are you looking for a bike that will ride around town and you don’t really mind about the specific motor? Any of these systems will be great and depending on the type of bike, the bike manufacturer will have picked the best eBike system for that bike model! We have an impressive demo fleet of electric bikes at all of our Leisure Lakes Bikes stores so if you want to try one out for yourself then give your local store a call to book a demo or join us at our next electric bike demo day!